Example of a letter sent home to students in a California experiment that failed to boost attendance rates. Source: The Demotivating Effect (and Unintended Message) of Awards by Carly D. Robinson, Jana Gallus, Monica G. Lee, and Todd Rogers Example of a letter that didn’t motivate students to attend school more in a California experiment. In 2014, Carly Robinson, a Ph.D. candidate at Harvard’s Graduate School of Education, noticed how schools across the country were handing out perfect attendance certificates as a way to motivate students to show up. Because of her work at the university’s Student Social Support R&D Lab, which hunts for low-cost solutions in education, she was curious to calculate just how much bang schools are getting for this two-cent solution to reduce absenteeism. Together with three other researchers at Harvard, UCLA and Stanford, she set up an elaborate experiment with more than 15,000 middle and high school students in California during the 2015-16 school year. Then the results started coming in. “I thought I was reading it wrong,” said Robinson. Instead of boosting attendance, the certificates either did nothing or reduced it. Among students who were told about being eligible for perfect-attendance certificates ahead of time, their attendance didn’t budge. But students who received the certificates as a surprise reward for their prior record subsequently started playing hooky, actually missing more days of school than a control group of students who weren’t eligible for the certificates. Academically weak students were the most likely to curb their school going. “The certificates made students attend school less,” said Robinson, clearly dismayed by what her experiment had wrought. The very youngest kids in the study were an exception. Sixth graders, when told about the prospect of getting a certificate, boosted their attendance. But when given the certificate as a surprise award for past attendance, they too started skipping school more, just like the older kids. The study, “The Demotivating Effect (and Unintended Message) of Awards,” is still a draft paper and subject to revisions. But it is interesting not only because it finds fault with a common practice in U.S. schools but also because it gives us more insight into when rewards motivate and when they backfire. 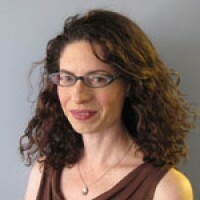 Robinson presented her findings in Washington, D.C., at a March 2019 conference of the Society for Research on Educational Effectiveness. Why were these certificates a bust? One theory is that attending school isn’t “cool.” Instead of making students feel proud of their accomplishment, the certificates might have embarrassed them although any embarrassment would have been relatively private. In the experiment, schools administrators didn’t publicly hand out the certificates in an assembly. They were mailed home in envelopes. A second theory, which the researchers explored in a follow-up study, is that rewards implicitly send the message to kids that they’re doing something exceptional, going above and beyond expectations. The students who received certificates concluded that they were overshooting expectations and adjusted their school going back down to what they believed their peers were doing. Intuitively, it’s an attractive idea to reward positive behavior but there isn’t a lot of research on how effective rewards are in schools. A 2016 study by University of Chicago behavioral economist Steven Levitt and colleagues found that non-financial rewards were more effective in raising test scores with younger students than with older students. The rewards appeared to motivate younger kids to put in more effort. Another 2015 study found that non-monetary rewards were useful in getting young kids to attend an after-school tutoring program. Like the current California study, it used certificates to motivate attendance. But this was for a voluntary program. And that’s where Robinson thinks the potency of non-monetary awards lie: it has to be for something extra that isn’t expected or required of everyone. 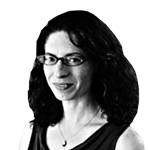 Thus, she speculates that rewarding kids for good behavior — another common practice among teachers — might also backfire because good behavior ought to be the norm. Both of these earlier studies also found that non-monetary awards were more effective for female students than male students. However, the California attendance study didn’t find any gender differences. Age was a factor in all three studies. Younger kids are more likely to respond to non-monetary rewards. Research has found that high school students can sometimes be motivated by money to put in more effort on a test but this sort of bribery is controversial. There’s also a psychological critique of rewards, with many arguing that they undermine a child’s ability to develop his or her internal motivation to do the right thing. These studies don’t address the long-term harm of using external rewards to motivate kids, just whether they’re effective in getting students to do things in the first place. It is unknown how many schools use certificates to reward good attendance. A quick search on Pinterest or Teachers Pay Teachers websites reveals dozens of templates and examples. Robinson said she has surveyed educators online and at a conference and found that a vast majority of schools do it. The advocacy organization Attendance Works encourages schools to reward good attendance. A 2016 California state law explicitly directs schools to recognize students with excellent attendance or those who demonstrate significant improvement. Even Robinson admitted that when she was a classroom teacher in Harlem, she used to reward her students with lunchtime dance parties when the entire class marked a full week of perfect attendance. In the California experiment, Robinson randomly assigned students in grades six through 12 to three groups: retrospective awards, prospective awards and no awards. For the retrospective awards, about 5,000 students were sent a congratulatory letter in January for achieving at least one month of perfect attendance in September, October or November. A full-size personalized reward certificate was included in the letter. The hope was that students would feel proud of the recognition and repeat the behavior. But the following month, February, these students missed 8 percent more school days compared to a control group of roughly 5,000 students who weren’t eligible for a reward. Low-achieving students drove this disappointing outcome. High-achieving kids who received the awards continued attending school as before. It was the low-achieving kids who started to go to school less. 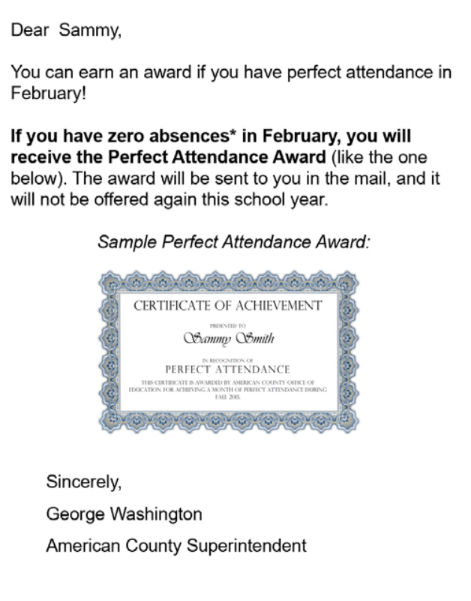 For the prospective awards, another 5,000 students were mailed a letter in January, telling them about the opportunity to earn a perfect attendance certificate in February. That didn’t change behavior for most kids. Their attendance, on average, didn’t improve or worsen when compared with a control group. Sixth graders were an exception, missing 17 percent fewer days than the control group. In order to be randomly assigned to one of the three groups, every student in the experiment had to have had a perfect month of attendance in the fall. (Without a perfect month of attendance, a student couldn’t get a retrospective certificate.) That limited the study to 88 percent of the student population in these 14 school districts. One might wonder if rewards could have helped students who struggle more with truancy. Similarly, one might also wonder if the rewards would have been more effective if they were issued every month and not a one-time prize. But given the harm that this experiment already wrought, Robinson said she didn’t want to tweak the study design and try again. “I personally don’t think awards for attendance are the way we should be going about motivating students,” she said. Instead, the Harvard lab where she works is finding one of the most effective ways to reduce absenteeism is to keep parents informed. She and her colleagues have been experimenting with mailing personalized letters home, noting the number of days absent for each student. “Parents underestimate the days that their child has missed,” said Robinson. The letter home also explains how missing school once or twice a month, even though it doesn’t feel like that much, puts a child on a pace toward becoming chronically absent. These letters, she said, have reduced missed school days by as much as 20 percent and cost only $5 for each recaptured school day. This story about attendance certificates was written by Jill Barshay and produced by The Hechinger Report, a nonprofit, independent news organization focused on inequality and innovation in education. Sign up for the Hechinger newsletter.